Giving antibiotics to a bird of prey with a bacterial infection is no easy feat, and it’s a task that tends to ruffle some feathers for the raptor. Delivering medication requires catching and restraining a bird whenever they need their next dose, which causes stress, and current antibiotics used for raptors can require handling a patient daily or even several times daily. Dr. Miranda Sadar, assistant professor in the Avian, Exotic, and Zoological Medicine service at the James L. Voss Veterinary Teaching Hospital, is exploring the use of a long-acting antibiotic commonly used for horses, cows, and pigs on raptors to see if it would remain active in the bloodstream longer. This would reduce the need to restrain birds as often over the course of their treatment. She’s already tested the drug, called ceftiofur crystalline free acid, which goes by the brand name Excede, on red-tailed hawks, and found that doubling the typical dose extended effects of the antibiotic from three days to about five days. 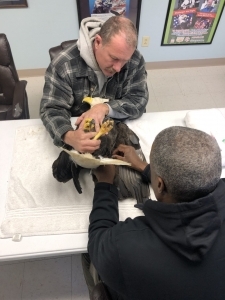 After proving that using Excede on red-tailed hawks was not only effective, but also did not cause adverse effects to the birds’ flight muscles, Sadar has set out to determine if use of the drug on eagles will yield similar results. She’s partnering with Dr. Michael Jones, professor of avian and zoological medicine at the University of Tennessee Knoxville, who manages rehabilitation and routine physicals for the eagles at the American Eagle Foundation. 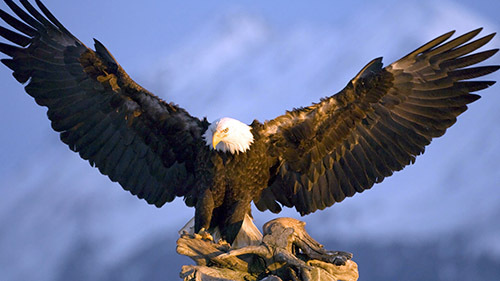 The foundation is providing six bald eagles for the antibiotic trial, all housed at the American Eagle Foundation’s Eagle Mountain Sanctuary at Dollywood, the largest exhibit of non-releasable bald eagles in the United States. All of the birds involved have physical disabilities with at least partial flight ability and would not be able to survive in the wild. In an aviary environment, eagles are still susceptible to bacterial infections, and would directly benefit from the results of the trial. 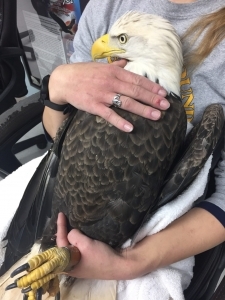 “With wildlife, stress is always a factor in captivity, so this research could have a huge impact on rehabilitation of the eagle population as a whole,” said Katelyn Dotson, curator of birds at the American Eagle Foundation. At the end of February, Sadar flew out to Tennessee to administer the second of two rounds of medication and observe levels of Excede in the eagles’ bloodstream by taking blood samples over the course of several days. Working with a pharmacologist to analyze the samples, she will be able to determine if the increased dose of the antibiotic was effective and hopes to have results later this spring. Watch the Dollywood eagles on a live webcam here.